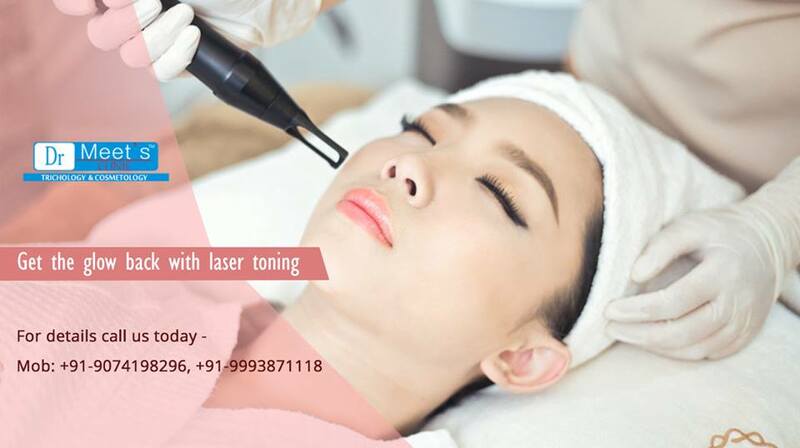 Home Posts Tagged "Laser Treatment In Indore"
The laser has become an effective surgical instrument commonly used for a number of procedures. One of the most popular is the usage of laser for the quick, gentle removal of unwanted hair. The laser works by emitting a pulsating beam of light, of a certain wavelength to particular areas on the skin. The light passes through the skin, and gets absorbed by the pigment in the hair follicle and shaft. Once absorbed by laser light, the follicles are weakened from future growth, and eventually die off. Laser hair removal has come a long way since 1998- when the first laser for hair removal got FDA clearance. Previously laser were very slow and painful and worked only on people with very dark hair and very light skin. But, today it is effective on all skin colors. When considering laser hair removal, remember that laser is not for everyone and their right use requires great training, skills and experience. So, it is best to have a laser-trained dermatologist like Dr. Meet, perform the procedure. For great results, the hair pigment must be darker than the surrounding skin pigment. Laser hair removal is easier to perform on light skin. Fewer treatments are required and faster, better results are achieved. For people with darker skin, more sessions are required and results are slower. However, it is best to consult an expert to find out if you are an ideal candidate for the laser hair removal. Even though one laser session can give great results, usually, multiple treatment sessions are required to see best results. Mainly, this is due to the fact that laser hair removal is most effective for hair, which is in the growth phase. As hair grows in cycles, at a particular time not all of the hairs are in the growth phase. In addition, sessions are vital to catch all of the hairs when they are in this phase. Almost, any area can be treated. The most common ones include: legs, bikini line, abdomen, back, underarms, chest, upper lip and face. As far as the pricing is concerned, it differs from doctor to doctor and also depends on the area being treated. However, clients are advised to seek the best center with the highest quality guarantee instead of lowest cost. Laser hair removal requires skills, experience, expertise and a knowledgeable staff. Post treatment, most patients experience a mild-sunburn type of sensation that lasts only for a few hours. Moisturizers and cool compresses can assist to get relief from the burning sensation. For laser hair removal in Indore, feel free to contact us. Skin problems are very common these days. There are various reasons for the same, from the hectic lifestyle to stress to pollution. Many people today feel that the skin of their face has patchy discoloration. It usually looks like strange tanning, a birthmark or dense freckling and is usually concentrated on your cheeks, forehead or jawline. This blemished, symmetrical skin pigmentation disorder is called melasma. Melasma is very common and affects an approx. 6 million people is the US, mainly women between the ages of 20-50. It usually develops during adulthood and is often caused due to pregnancy or sun exposure and is more common among people with dark skin tone. Avoiding further sun exposure can manage melasma, but it won’t make it disappear. Thankfully, a variety of techniques are available to get rid of blemishes. Some people use acidic creams to reduce the appearance of the blemishes, but this method is not as perfect and doing it at home can often lead to misapplication. The other effective solution is laser toning. Laser toning is helpful in cases that are resistant to other methods. It has been shown to be the most effective treatment for melasma, and it is quick- non-invasive and long lasting. And more important, there is zero recovery time between treatments. It is a tow part process that works by heating the dermis layer, which produces collagen. The dermis is below your top layer of skin, called as epidermis. The new collagen in the dermis will make your skin look fuller and tighter, and it will change the way your skin makes the melanin that is responsible for uneven coloration. No! You might experience a tingling sensation or a sensation of heat due to laser, but surely no pain. It doesn’t actually damages the top layer of skin; it doesn’t cut, remove or burn your top layer of skin, but works through and under it, so it is pain free. Laser toning won’t only treat your melasma, but it improves the overall appearance and texture of your skin. It promotes sub-dermal collages and improves your skin’s texture and tone along with its coloration. Laser toning decreases fine wrinkles and pore size and will give your skin a young glow. And though it usually requires about 608 sessions to appropriately decrease the visibility of melasma, the treatments will continue working under your skin even after the last session. If you suffer from melasma, or you want to get laser toning done due to its other restorative benefits, come in to Dr. Meet’s Clinic today.